Tonsils are lumps of soft tissue and are part of the immune system. You have two tonsils, one on either side at the back of the mouth.Tonsils vary in size from person to person. A main function of tonsils is to trap germs (bacteria and viruses) which you may breathe in. Proteins called antibodiesproduced by the immune cells in the tonsils help to kill germs and help to prevent throat and lung infections. You can normally see your tonsils by opening your mouth wide and looking in a mirror. They are the two fleshy lumps that you can see at the sides and back of the mouth. 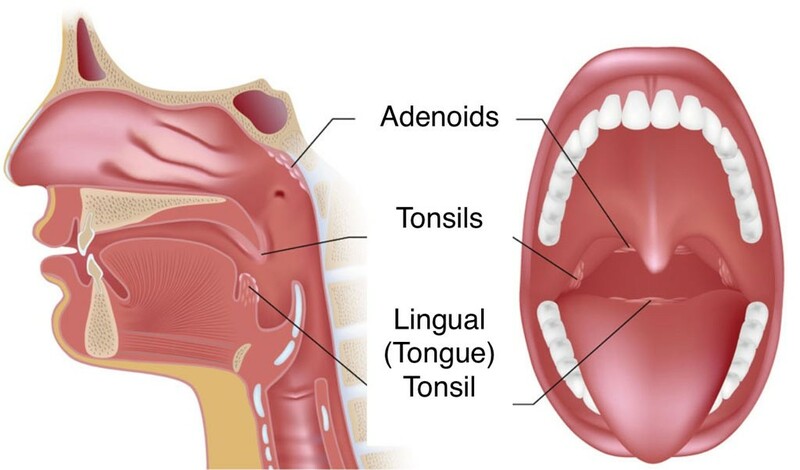 Adenoids is the name given to a lump of lymphoid tissue that sits between the tonsils, higher up in the back of the mouth. Adenoids trap germs that enter the body through the nose.This tissue cannot be seen without special instruments or x-rays, since it is hidden behind the roof of the mouth. This mouth breathing can cause permanent changes in the facial shape – “adenoidal facies” with elongation of the face and an open-mouthed, slack-jaw appearance. Nighttime respiratory obstruction, with snoring and even sleep apnea can cause significant load upon the right side of the heart. Other problems caused by chronic adenoid hypertrophy include blockage of the eustachian tubes and chronic ear disease and hearing loss. Tonsillitis:Tonsillitis is an infection of the tonsils. A sore throat is the common symptom. In addition, you may also have a cough, high temperature (fever), and headache, feel sick, feel tired, find swallowing painful, and have swollen neck glands. Glandular fever (infectious mononucleosis):infectious mononucleosis is caused by the Epstein-Barr virus. It tends to cause a severe bout of tonsillitis in addition to other symptoms. See separate leaflet called Glandular Fever (Infectious Mononucleosis) for more details. Quincy:This is also known as peritonsillar abscess. An abscess is a collection of pus. Quinsy is an uncommon condition where an abscess develops next to a tonsil due to a bacterial infection. It usually develops just on one side. It may follow an episode of tonsillitis or may arise on its own. Cancer of the tonsil:This is a rare cancer. It is more common in smokers and those who drink a lot of alcohol. Infections with viruses or bacteria. Once an infection clears, the swelling often goes down but sometimes the adenoids remain enlarged. Often there is no apparent cause. • A white or yellow coating on the tonsils. • A slight voice change due to swelling. • Uncomfortable or painful swallowing. • Swollen lymph nodes (glands) in the neck. Adenoids are greatly benefited and often times permanently cured by a weekly dose of Tuberculinum or preferably Bacillinum. Obstruction of the nostrils from adenoids. Throat deafness. Clarke of London regarded this remedy as a leading one in cases of adenoids. yogahealthpro is using Hatena Blog. Would you like to try it too?